Joseph C Smith's great-nephew Nick Mann was able to provide us with details of Joseph's life as well as photographs of him. Whilst at Lloyd's Register he played for the Lloyd's Register's Cricket XI. playing for the cricket club, before enlisting in 1915. 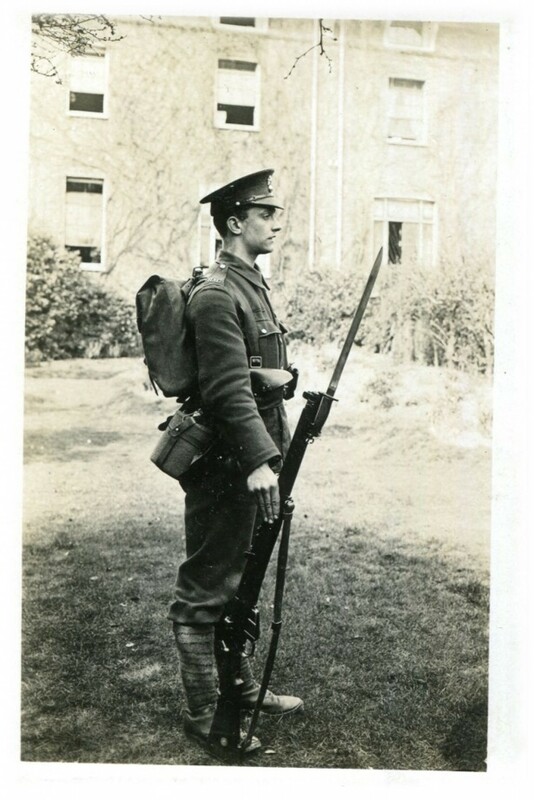 With several of his school friends he joined the 2nd Battalion of the HAC as a private. He enlisted in 1915 along with several school friends, joining the 2nd Battalion, Honourable Artillery Company as a private. The Battalion was posted to France and Joe spent the winter of 1916-1917 in the reserve trenches at the Somme. His letters home had two themes; requests for food - he seemed permanently hungry - and accounts of football matches he either organized, refereed or played in. He wrote regularly to his girlfriend Dolly as well. He was hospitalized with frost bite and spent some time in a field hospital (where he enjoyed hearty cooked breakfasts) before re-joining his battalion, which was redeployed to Bullecourt in 1917. The Battle of Bullecourt was the Allies initial attempt to break the Hindenburg Line and was a bloodbath. The Hindenburg Line was built in the winter of 1916-1917 as a German defensive position, stretching from Arras to Laffaux. The line was a system of German defence fortifications behind the northern and central sectors of the Western Front. Each sector had its own system of mutually supporting strongpoints backed up with barbed wire, trenchworks and firepower. Following an unsuccessful attempt to capture Bullecourt in April, the British prepared for a second attempt. In the early hours of the 3 May, the Allied forces began attacking the village of Bullecourt in order to penetrate the Hindenburg line. German resistance was fierce and when the offensive was called off on the 17 May. The British had been able to push the Germans out of Bullecourt but suffered severe loses and failed to advance further. Many of the casualties were Australian, although the enthusiastic but inexperienced HAC battalion was decimated too. Out of 850 fewer than 100 survived. You can visit the battleground today, where there is a museum. Joe was in the bombing section of 11 Platoon. C Company. He wrote a postcard dated 3rd May saying all was well. A little later, he was shot as he got out of his trench to advance; in the confusion it's not clear exactly what his injuries were but he died of his wounds two days later on the 5 May 1917. He was only 19. Smith is buried in the extension section of the small cemetery established next to the field hospital where he was treated, called Achiet-Le-Grand. The HAC archive includes letters to his parents from the priest at the hospital, his comrades and old school friends, and his company commander, who himself was killed shortly thereafter along with nearly all of C Company, while defending a salient against a German counter-attack. 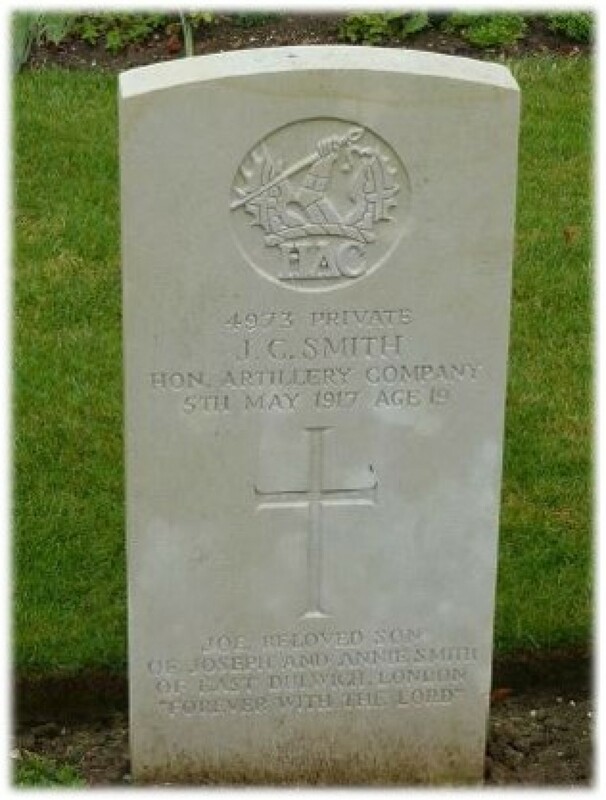 Smith's name can be found in the Achiet-Le-Grand Cemetery, France. For further burial details, including Smith's grave registration report, visit his portal on the Commonwealth War Graves Commission website. More information about Smith can be found on the Imperial War Museum's Lives of the First World War website or on the Alleyn's School First World War memorial website. Photographs of Smith can be viewed below. Published with kind permission of Nick Mann. If Joseph C Smith is one of your relatives or you know more about his life, get in touch at hec.info@lrfoundation.org.uk!